There are few sentences in the English language as redundant as "This Adult Swim show is weird." Yes, the shows which comprise the late night portion of Cartoon Network's broadcast day are indeed unusual, and they typically do this simply for the sake of being unusual. I can't say that I've seen every show from this cavalcade of oddities, but I've sampled quite a few of them and, to me, they are decidedly hit or miss. For every one that I truly enjoy (The Brak Show, Frisky Dingo), there are many others which did nothing for me. And, it doesn't help that I often don't check out a show until it hits DVD. However, one which I had to experience from the outset from Mike Tyson Mysteries because, let's face it, with a title like that, it was either going to be memorable or a trainwreck. Mike Tyson Mysteries stars (who else?) Mike Tyson, as a version of himself. Like the real Mike Tyson, this Mike Tyson is a former boxer who lives in Las Vegas. The different is that this Mike Tyson lives with his adopted daughter, Yung Hee (voiced by Rachel Ramras), the Marquess of Queensbury (voiced by Jim Rash), who happens to be a ghost, and a foul-mouthed, alcoholic talking pigeon, who simply goes by Pigeon (voiced by Norm MacDonald). For reasons that I don't think are ever clearly explained, Mike Tyson and his friends enjoy solving mysteries and people send notes to them asking for help. So, Mike finds himself traveling the world in order to help other which his three companions bicker and complain. No matter what Tyson's grasp of the show is, I hope that he understands what a weird and funny show this. If you read the above synopsis, then you should already get a hint of how strange this show is. When a ghost and a talking pigeon is involved, this isn't exactly a CBS prime time show. Clearly, the overall conceit of the show is a takeoff on the classic Hanna-Barbera animated mystery shows from the 70s, which was, of course, kicked of by Scooby-Doo Where are You!, which was followed by other entries like Clue Club, Jabberjaw, and Speed Buggy. All of these shows featured a diverse group -- that often included an animal or an object who could speak -- that solved mysteries. Mike Tyson Mysteries does a great job of emulating these shows, not only through the animation, which is spot on in its imitation of the classics, right down to the opening credits sequence, but with the odd combination of characters. Along with this creative homage, we get a consistently funny show where the jokes come from clever dialogue and truly bizarre situations. Any time Mike Tyson is meeting the likes of Cormac McCarthy or Garry Kasparov, you know that something weird is going on. We also have the group traveling to the Moon and Nicaragua to help solve mysteries. (Again, this mimics/mocks how Scooby-Doo and the gang would run into celebrities and were inexplicably traveling the world.) These odd situations do a great job of drawing the viewer in, where we then experience the jokes. Some come from Mike's odd reactions or his lack of knowledge, while other revolve around the barbs thrown by Marquess and Pigeon. While the best joke in the series involves frequent flier miles, the best overall episode is a spot-on spoof of House Hunters (entitled "House Haunters"). This episode assumes that you've seen House Hunters and if you have, you'll get a kick out of this. As with most Adult Swim shows, Mike Tyson Mysteries isn't for everyone. But, if you like quirky humor (and if you're watching Adult Swim, you probably do) and have an affection for Hanna-Barbera mystery shows, then you'll find something to like about the show. Obviously, the primary attraction is to see if Mike Tyson can be funny, and you'll soon learn that he can, and that he's presumably in on the joke in the funny, weird show. 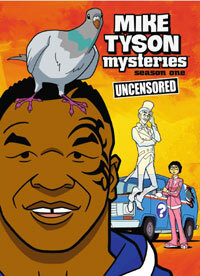 Mike Tyson Mysteries: Season One also never explains how Pigeon can talk on DVD courtesy of Warner Home Video. All ten episodes of the show's first season are included here. The show has been letterboxed at 1.78:1 and the transfer is enhanced for 16 x 9 TVs. The image is very sharp and clear, showing no grain and no defects from the source materials. The colors look excellent and the image is never overly bright or dark. The picture has a nice amount of depth and it is never soft. This rivals HD broadcast quality. The Disc carries a Dolby Digital 5.1 audio track which provides clear dialogue and sound effects. The stereo effects are noticeable and we occasionally get a nice surround sound effect. There is some subtle bass here, but I didn't note any great subwoofer effects. The Mike Tyson Mysteries: Season One DVD contains no extra features.